Written and posted by Rachael Funk of Travel Impressions. 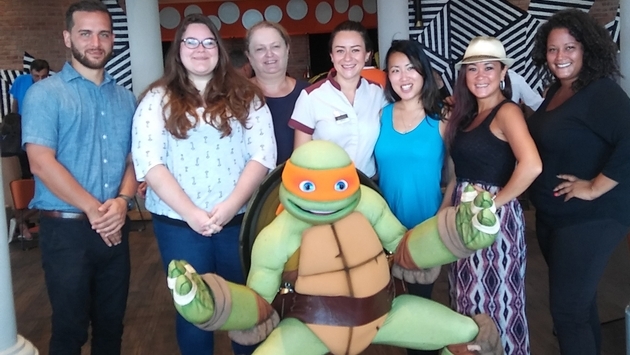 Just recently, I went to the Gourmet Inclusive Nickelodeon Hotel & Resort Punta Cana by Karisma (not to be confused with the Florida hotel) on my very first FAM. When it was finally time to go, I threw my clothes in a bag, Instagrammed a photo of my ticket and passport with the ultra blasé caption, "OH NOTHING, JUST A QUICK JAUNT TO THE CARIBBEAN FOR WORK," and hopped on the plane. Blind with exuberance, I was hasty and committed some rookie travel mistakes. With my face firmly in my palms, I’ve supplied a few of them below in a list I wish I’d had before I left. 1. Don't be afraid to crowd-source clothing suggestions from seasoned coworkers. Wardrobe was my biggest downfall. Having never been to the Caribbean, I thought, "It's humid in New York! How much more humid could it be in DR? I'll just bring my work clothes." MUCH more, as it turns out. When you’re looking into an endless abyss of denim, you’ll have regrets. 2. Don't skip the sunscreen. Um. Just ...if you're going to the Caribbean, bring sunscreen. I thought I'd be clever and skip it so I could carry my bag on, but sunscreen at the gift shop was $30 and I hit empty within 24 hours. Checking your bag is worth it. And with our DVFs, checked bags are often included, so ask your reservations agent when you make that booking with us! 3. Don't play it cool with the Gourmet Inclusive--eat like you mean it. Get your head in the game! Lucky for me, my travel buddy, Su-Jit Lin (your usual author for this blog), is a professional foodie and had the Gourmet-Inclusive® handled. There were blueprints, battle plans, pep talks, and that was just for the coffee shop. It was beautiful and terrifying and we didn't miss a single delicious thing. 4. Don't go in the ocean if the red flag is up. This one wasn't actually me, but lesson learned, nonetheless! Nobody noticed the red flag hoisted at the beach as they sprinted to the water and an unusually aggressive wave stole a fellow FAM-er’s eyeglasses and her drink. A moment of silence for those lost items – the sea has them now. 5. Don't be the first to go to bed. Some of my favorite FAM memories were made after 9 PM, and not just because of the fantastic resort nightlife! This is an amazing opportunity to get to know the people in your group and unwind together. It is imperative you do not skip this part. Get to know your FAMily! You never know who's got a hidden talent or what stories you'll tell for the rest of your life. Refuse. You could probably live here forever—especially when it’s the Gourmet Inclusive Nickelodeon Hotels & Resort Punta Cana by Karisma. So why not? For more on the #NickResortReport, view Su-Jit and Rachael’s video recap on brainshark.com/travimp/NickResortReport. To get access to insider information on the property, visit facebook.com/travelimpressions and search #NickResortReport for the #WeekendLearning Series on this property! With experience in both advertising/marketing copywriting and editorial journalism, multiple-award-winning writer Su-Jit Lin-DeSimone’s passion for words is exceeded only by her love of travel. As communications manager for Travel Impressions, she uses that diverse background to create a unique bridge between marketing and storytelling, whether it’s used to share her excitement for Travel Impressions’ latest deals and agent-oriented programs and incentives or for new destinations and suppliers that inspire.